Do the vocals on your favorite song sound like a vocoded chipmunk? Yes(?). Did you use extreme auto-tune settings in the sensitive ballad you wrote for your girlfriend, who then dumped you because, as Jay Z said, “Auto-tune is Dead”. Never fear, you can now recapture the emotive intensity of your original vocal performance complete with the off-kilter, yet somewhat charming intonation for which you are known. Introducing Moog Music’s MF-401 Auto De-tune, featuring Authentic Vocal Imperfection(tm) technology, even a T-Pain vocal can be restored to its complete original character, scrubbing the pitch correction and leaving the untreated vocal in all its wavering sharp or flat glory. Results may vary, and Moog Music in no way bears responsibility for discomfort or irritation caused by the use of the MF-401. 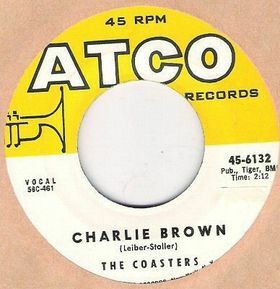 As we rethink our panini preferences, we might recall that it was on this date 1959 that The Coasters’ single “Charlie Brown” was banned by the BBC because it refers to “throwin’ spitballs.” The ban lasted 2 weeks. “Young Blood,” “Yakety Yak,” “Poison Ivy,” and other Coasters’ hits were deemed less threatening to the morals of young Britons, and were spared ostracism.